This is a story about the guardians of the New Forest. Some of you may well know that I spend a lot of time living in a suitcase somewhere in between Hythe near Southampton and here in Weymouth. Luckily a significant proportion of 60 miles between the two locations lays the New Forest. That’s 74,000 acres. Once upon a time, circa the 13th century Verdererswere part of the ancient judicial and administrative hierarchy of vast areas of Royal Forests set aside by William the Conqueror for hunting. The title Verderer comes from the Norman word ‘vert’ meaning green and referring to woodland. In those days there were five appointed Verderers, the chief Verderer was responsible for the agricultural practices conceded by the Crown to local people. The principal of these is the depasturing of ponies, cattle, pigs and donkeys in the Open Forest by authorised local inhabitants known as Commoners. The Chief Verderer was appointed by the Crown and the others were elected locally by registered commoners living within the New Forest. The Verderer’s remit was to investigate and recorded minor offences and deal with the day to day forest administration. When ship-building became big business during the 17th Century the Verderers’ powers were enlarged to address offences undermining the planting and preservation of oak for ship-building. The New Forest Act of 1949 increased the number in the Verderers court to five elected, and four appointed members. The Act also gave the Verderers additional powers to make and amend byelaws. The most recent and obvious is the reduction in the speed limit to 40 mile per hour. This has resulted in a 50% decrease in pony deaths on the New Forest roads. To this day the Verderers hold court 6 times a year. Of course, this lead on to us finding out what was meant by the term commoning. Pannage or mast – This is the right to turn out pigs during the ‘pannage’ season in the autumn to feed. 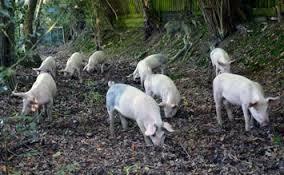 The pigs provide a useful service by eating acorns that are poisonous to ponies and cattle. Estovers or fuelwood – This is the right to cut wood or fuel. To protect the Ancient and Ornamental woodland, commoners who exercise this right are now provided with firewood from timber plantations by the Forestry Commission. So far we’ve found out about the Verderer; the commoner and their rights – but we found one other key member of the New Forest folk: The Agister. The Agisters are employees of the Verderers. Their remit is to assist in the management of the commoners stock in the forest. They watch over the forest to ensure the owners of departures stock meet stock welfare requirements. Agisters are commoners in their own rights. The role is medieval in origin. That means they must occupy a minimum of one acre of land with pasture rights. The word agist means to take in to graze for payment. In the spring they collect the marking fee which is the payment a commoner has to make for each animal he wishes to turn out onto the forest. During the year they monitor the welfare of the livestock. Agisters are called out to deal with all sorts of problems for example; animals get stuck in bogs and ditches, fences or cattle grids. They get colic from eating fermented lawn cuttings. But sadly the most common call out is for road accidents. In the late summer or early autumn the Agisters organise the drifts or round up of the forest ponies. The ponies are tail marked at this time. In the 2009 report the Agisters recorded: 4840 ponies but also: 2539 Cattle, 324 Pigs, 91 Sheep and 128 Donkeys. That’s 7922 animals roaming freely in the New Forest. The New Forest is, without doubt, a unique landscape. It is wild yet tranquil with its ancient woodland, salt marshes and mudflats; heather-covered heaths, mires, farmland, and of course its wildlife and village life. The Crown still owns most of the land, William imposed legal powers to arrest settlement by the local inhabitants and these limitations remain to this day in some form. Next time you’re passing or worse; stuck on the A31 over the top of the 12 mile stretch from Ringwood to Cadnam, remember that there remains another magical world either side of that road.